Time to swap your old bags and luggage for new ones at the Trade-In Sale. 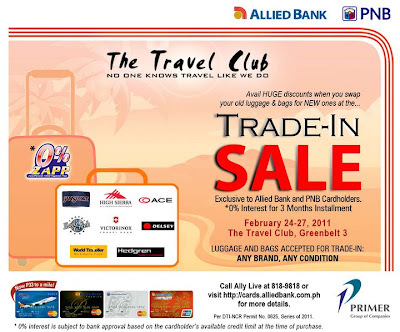 Enjoy 0% interest for 3 months installment for purchases of at least 3,000 Pesos when you visit The Travel Club Greenbelt 3 on February 24-27, 2011. Take part in this one-of-a-kind event - exclusive to Allied Bank and PNB Cardholders only. 1 comments on "Trade-In Sale - The Travel Club"